Just about everything above-the-fold is ads. There are four ads on top. The only organic content is from Wikipedia. It’s no wonder that registrars (including Google itself) are paying to advertise for the term. Another blow to domain names in search. Domain names and URLs that contain terms people search for on Google have long been thought to have some sort of advantage. For a while, Google seemed to give preference to “exact match domains”. Then it tweaked the algorithm to downplay this, at least for low-quality sites that were created to take advantage of this benefit. I believe that good domains with popular keywords still can get a boost thanks to the anchor text people use to link to them. But the other day I was doing some searches and noticed that domain names have been demoted again. Google used to bold the words you searched for if they were present in the URL. This was something new top level domain marketers pointed to as a benefit; even if the keyword was part of the top level domain it was bolded. But Google has apparently stripped the bolding from URLs. It still bolds words in the description, but not the URL. This is bad for domain names, as every bolded word has to give some sort of boost to click-through rates. A search for “hockey” has bold terms in the description, but not the URL or title. Things are even worse on mobile. Two years ago, Google stopped showing domain names at all in mobile search results. It makes sense for Google to downplay domain names. They want people to start their navigation at Google instead of remembering domain names. See a new TLD in action by searching for “coffee club”, company suggests. 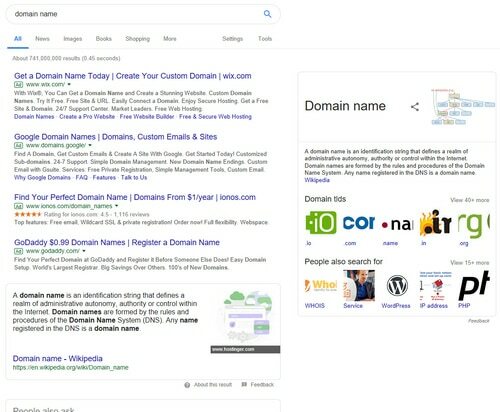 It’s not from Google’s search team, but a new blog post today from Google Domains seeks to clear up any misunderstanding about new domain names and search. The post answers common questions about new domain name endings, such as will they affect my website’s search ranking (no) and can I move my site to a new domain name (yes). Google uses Coffee.club as an example of how new domain names show up in search. It suggests typeing in “coffee club” at Google to see how a new TLD shows up in results, just like a .com domain name does. The rest of the post if a marketing pitch for new top level domain names, providing examples of how domains can help with brand identity and promotions.